I hate contests that ask you to do all kinds of crazy stuff for a few bucks or maybe a little trinket. So in general, I end up avoiding giveaways on Toolmonger. 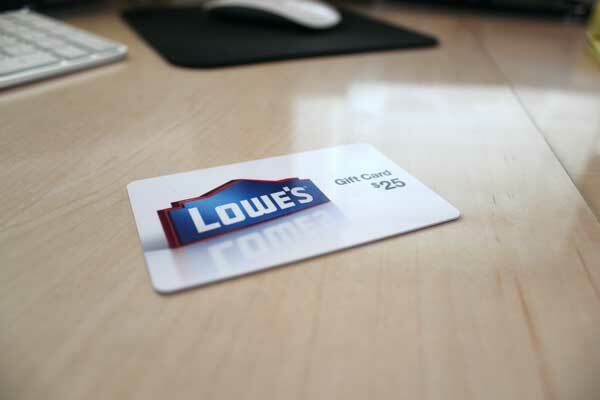 But the folks at Lowe’s were kind enough to hand us a $25 card to give to one of you, and we know you could probably find a way to spend it — we could — so I figured I’d go ahead and post it. But I won’t ask you to do anything annoying — hell, anything you wouldn’t do anyway. Here’s what we’re gonna do. We’ll pick our favorite comment posted sometime in the next week, and we’ll contact you (whomever you turn out to be) via the email you enter with your comment, and if you respond (i.e. you entered a real email address), we’ll drop the gift card to you in an envelope. We appreciate the time you spend adding your knowledge, experience, and general enjoyment to TM. Really! Lowes has always been kind to the non profits that I volunteer with. They are the big box I go to first when I need something from a big box store. Thank you for making this a low hassle entry. Well, not a snazzy comment but here goes: I want to win to help with getting insulation in the attic that I have been needing to get for a year now. Got the home last year and I am not going to go thru another less than cozy winter. My wife wants a screen door for the atrium-style patio door (one door is hinged) coming from our family room. The door is 65″ x 96″ and therefore not on most people’s radar as far as having something that will fit it. She wants a slider instead of a hinged door and that limits it even further. Now if you have unlimited funds and more money that sense, the possibilities do exist. I have neither and I am one to always look for a way to “engineer and make” items that I need around the house. I am on the hunt for the parts I will need to create a one-of-a-kind barn-style sliding screen door to suit the job my wife is asking of it. I have just about sourced all the items and will be starting the project in the next week or so. I will provide a narrative and photos of the project back to TM readers when I have completed it. I could use the $25 gift card to help me with the purchase of all the parts and pieces. My family just got a little bit bigger! My daughter is almost three months old it is challenging to find time to work on different projects around the house, especially when you have to borrow tools. I have been eyeing the Hitachi 10″ miter saw. Easy to set up and put away and really a good buy. With the giftcard I could get the thumbs up to buy it from the Wifey. I was glad to see that it was for lowes and not the other store which i don’t like shopping at anymore. I would use the gift card to buy my husband one of the Inspection Cameras you blogged about the other day. Between him and our two sons, somebody could say “what the hell is that in the wall or the car or the toy or the cat every day. Well, maybe the cat would be a bad idea. Ive been following this blog for about 2 years now. Good info. I also enjoy free stuff. I ejoy free things also,but one of the best free things I use is Toolmonger for info and comments from fellow readers. Wife here. We are newlyweds (yay!) and somewhat new homeowners…and also grad students (i.e. we have little/no money). We started a summer project of painting some rooms in the house to make it feel more like ours…but we never finished. Would love the giftcard to fund our painting project. If sound can’t travel in a vacuum, how come vacuum cleaners make so much noise? Oooh, free! I’d use it to buy a poplar tree and plant it in my yard. It’s quiet IN the vacuum, it’s just noisy outside you can’t hear it. Not that the rules can be changed after the “contest” has started, but I think that the gift card should go to frequent commenter “Fred” as lifetime achievement award. I’ve learned more from him than all of the other commenters combined. And that’s not a disparagement of the other commenters, just an approximation of the awe with which I regard Fred. Free Lowes card? Add some pizza and a Blue Moon, and you got yourself a deal! $25 for my thoughts? Deal. After all, I am a Lowes giftcardmonger. I have used Lowe’s recently in Waco, TX to help paint an elderly family member’s home of the past 30 years. Each and every person in Lowe’s has been the most helpful and informative, I am a mom with kids trying to do the right thing and teach my kids to do for others, Lowe’s you HELP! Thanks. We are in the middle of a huge remodel and could definitely use this! We’re practically on a first name basis with everyone at Lowe’s. We drop our daughter off at dance class and head over to Lowe’s with our two little boys (No! Not Lowe’s again!–You would think that would be better than grocery shopping, but apparently not). I LOVE Lowe’s. We have frequented them for our remodel, and they have been SO EASY to work with. Thank you for sharing your great blog and this great giveaway with us. love shopping every one is very nice.